5-Hydroxytryptophan, or 5-HTP, is the direct precursor to serotonin, an important neurotransmitter that participates in the regulation of emotional moods, sleep/wake cycles, nerve thresholds, and appetite. 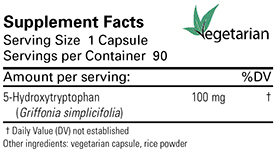 Extracted from plant sources (Griffonia simplicifolia), 5-HTP is a natural alternative to synthetic L-tryptophan, which is now available by prescription only. In addition to increasing serotonin levels, 5-HTP causes an increase in levels of endorphins and other neurotransmitters that may be low in some clinical situations. 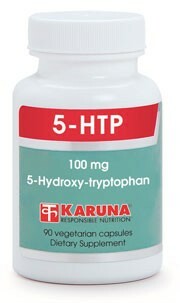 Serotonin is an important initiator of sleep, and 5-HTP has been studied for many positive benefits with sleeplessness. Research also suggests increased serotonin levels may promote early satiety for appetite regulation. 5-HTP was superior to placebo in relieving discomfort and other symptoms associated with chronic muscle syndromes (J Int Med Res 1990;18:201-9). In several studies, 5-HTP was superior to placebo for stabilizing vascular and nerve irritability in the structures in and around the head (Headache 2000;40:451-6; Clin J Pain 1986;3:123-9). 5-HTP has mood-stabilizing properties demonstrated in controlled studies (Psychopathology 1991;24:53-81; Neuropsychobiology 1988;20:28-35). 5-HTP was superior to placebo for improving the depth and duration of sleep in one study (Schweiz Bundschau Med (PRAXIS) 1998;77(34a):19-23). 5-HTP helped control appetite and improved weight-loss results in three controlled trials (Am J Clin Nutr 1992;56:863-867; J Neural Transmission 1989;76:109-117; Adv Exp Med Biol 1991;294:591-3). Suggested use for adults: One capsule per day, before a meal or at bedtime, or as directed. CAUTION: Not appropriate for pregnant or lactating women. This product should not be combined with antidepressant medication.